Kids will enjoy these button crafts, they are quick, easy and fun! If you don't have a button stash try finding buttons at craft and thrift stores. Quick tip for 3 & 4 year olds: If you have lots of different colored buttons, they make great pieces in sorting games. Gather together all of your red or pink buttons to make this cute button heart for Valentine's day, or any day! You can hot glue it together and tie a ribbon on it for an ornament, or as I did you can glue it to some cardstock and make homemade Valentine's Day cards. 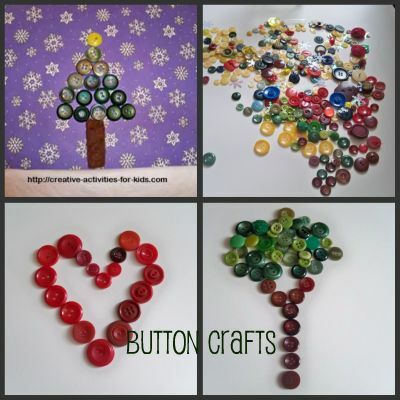 This button tree is such a fun project! Gather up greens and browns. Or use autumn colors, or white for snow, or pink for spring blossoms. As with the button heart you can glue, hot glue, or sew this to some fabric. Like the button crafts? Try the DIY craft supply page for more creative fun.